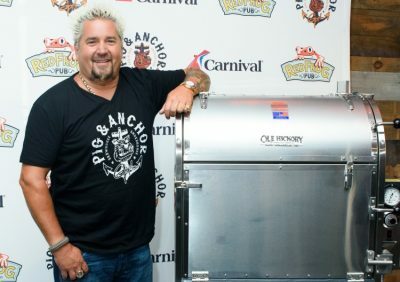 I don’t know why, but every time I see restaurateur Guy Fieri I’m afraid he’s one bite away from a heart attack (sorry, had to get that out of my system). Known for his bleached-blonde hair, flame-patterned shirts and sweat-soaked red face—the Food Network’s Diners, Drive-Ins and Dives TV show doesn’t feature foods for better health. And neither do Fieri’s home-cooked meals. But sometimes you’ve got to live a little; and there’s no doubt the food Fieri eats on triple D looks delicious. Just don’t eat it every day, otherwise you’ll be in for a lifetime of looking and feeling like you just ran your first marathon when all you really did was stuff some sausage in your mouth. It’s summer, and one of the most underutilized breakfast-builders is the barbecue. So if you’ve got a grill outside, it could be time to get creative. Although Fieri may put eggs on the menu, he sure as heck doesn’t eat them. And why would he? Eggs are actually good for you! Instead, he suggests grilling up some ham, sausage, steak or maybe some vegetables to toss on top of some stone grits. Guy Fieri’s breakfast ideas often include plenty of grilled or fried red meat and stone grits, a staple of the South. Being from below the Mason-Dixon line, grits are in Fieri’s blood, and occasionally deposited alongside his arterial walls (which may explain the red face). In any event, he’s not serving them up plain—no way no how. Instead, he’s got an item you might be unfamiliar with: red eye gravy—I couldn’t make that up! To get his gravy just right, Guy Fieri’s breakfast recipe includes cooked ham, strong-brewed coffee, water, butter, and pepper. He cooks it up nice and hot before pouring it over the grits, and I’ll be honest: it sounds wonderfully delicious. 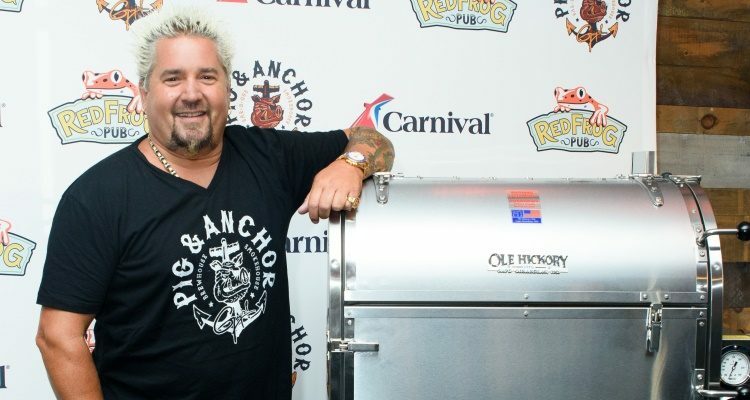 Guy Fieri has a poor diet and it shows. Eating at diners, drive-ins and dives might be a great idea for a television show, but it’s not so great when it comes to making healthy food choices. Everybody likes to go big sometimes, and in moderation grits, gravy and sausages are harmless. They stimulate your taste buds and make you feel good: but too much can lead to conditions like high blood pressure, high cholesterol and heart problems. So the majority of the time, it’s recommended you stick to healthier selections around your breakfast table like eggs, egg whites, oats, fruit, yogurt and vegetables. These items provide valuable nutrients like healthy fat, complex carbs, fiber and protein, while keeping you full and contributing to a healthy lifestyle. When it comes to eating an unhealthy meal like you’d see Fieri put back on his show, I’d say do it once per week, depending on your goals and health. If you’re just beginning a weight loss program, I’d put it off until you’ve started making some progress. Doing it once a month is more in your range. For those of you with severe health problems, like high blood pressure or heart disease, I’d recommend avoiding it until you’ve made some headway in improving your condition; but talk to your doctor fist. Roberts, A., “Guy Fieri’s Go-To Breakfast is Heart as Hell,” July 25, 2016; http://www.popsugar.com/food/What-Guy-Fieri-Eats-Breakfast-41441675, last accessed August 23, 2016.